Normally most collectors do not get overly excited about the normal lenses that come with nearly every body they purchase as they build a collection. All of us end up with an over-supply of repetitious 50mm/fl.4 and 2.0 lenses that all look alike, are not worth much and are impossible to dispose of. I actually look forward to finding lensless bodies to help balance things out so I don't have a batch of lenses lined up like tin soldiers on a shelf. One reason that we all end up with excess normal "normals" is that the Nikon system has its share of special and unusual 50mm, lenses that really help make things interesting. Fortunately, many of us find the more esoteric normals on bodies, but some are often found by themselves since they were originally sold as options (50/fl.1 & Micro come to mind!). Also many have been separated from their original body by age, since it is more likely that the body has failed and been replaced and the lens retained, causing many mis-matches. We are fortunate to have a good supply of interesting normals to obtain, and not least amongst them is the rather rare 50mm/fl.5 Nikkor from 1950. The period of 1949-51 seems to have been a busy time at Nippon Kogaku. Much was happening such as: the debut of the first synched Ms; the rigid 50/f2.0; the 85/fl.5 & 250/f4, and the upgrade of the 135/f4 to the 135/f3.5 type. But something else was happening with the normals. Up to 1949 the fastest normal made for the Nikon was the f2.0 (if you don't count the "experimental" fl.8 of 1948! ), which put them at a decided disadvantage to Leitz and Zeiss, both of whom had fast fl.5 lenses, with the Zeiss Sonnar being the most famous. obviously the designers at N-K knew they needed a faster normal to compete, for speed was everything during this, the "available light" era of 35mm photography. 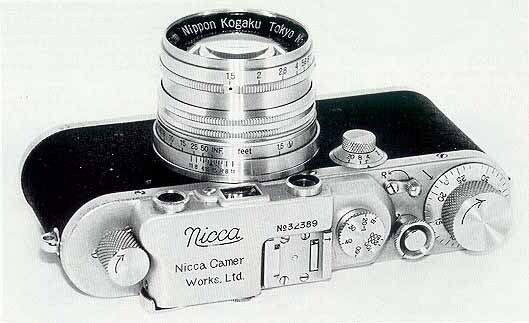 Sometime in mid-1949 work began on a faster Nikkor and, probably because of the Zeiss Sonnar, a speed of fl.5 was chosen. The result is the subject of this article. 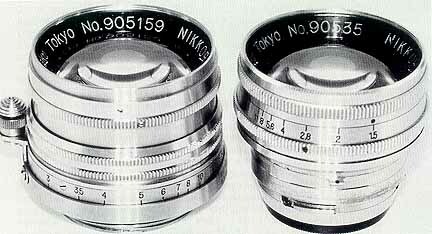 The 50mm/fl.5 Nikkor-S was introduced in early 1950, but the serial numbers suggest that the design was completed in mid-1949. The first batch of 1.5s begin at #9051, which would be May 1949, with a second larger batch starting at #9071, or July 1949. 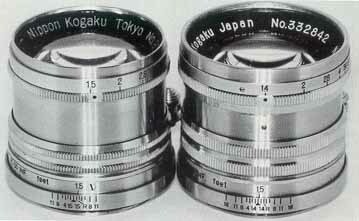 It is not known why two different numbers were used for such a short production item, and why "906" was skipped over (one 906 lens has been reported but it might be an error and has not been verified to date), since lenses from both batches appear to be identical, unless some optical difference exists. Whatever the reason, recorded lenses to date range from #9052-905520 and #907163-907734, suggesting a total production of approximately 1100 lenses, with the 907 type slightly larger. However, the numbers were shared with screw mount lenses which were much more common in the 905 batch, with the result that fewer Nikon mount "905" lenses appear to exist than the "907" variety. 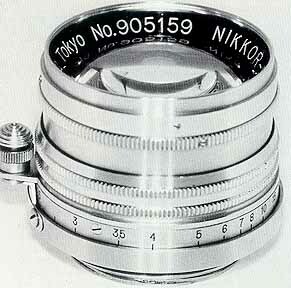 At 1100 units the fl.5 Nikkor is one of the least common Nikon normals, with more Micros and fl.ls made than this lens! Why were so few made when having a faster lens was so important? Because by May of 1950 N-K had designed its now famous fl.4 Nikkor, The earliest 1.4s begin at #5005, or may 1950, which is exactly one year after the 1.5 design was finished! If dates and serial numbers are reasonably accurate, then the 50mm/fl.5 Nikkor-S was available for only one year, which accounts for its relative rarity today! Why was it replaced so quickly? Maybe it wasn't sharp enough and the 1.4 was better (seems like a good subject for a comparison test! 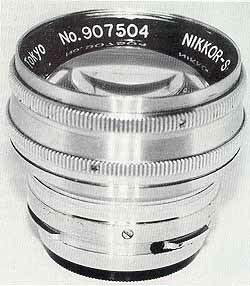 ), or maybe it was because the first ads for the 1.4 Nikkor proclaimed it to be "The first normal lens faster than fl.5!". We all know there is really little difference between the two, but it made for good ad copy! However, the probable reason has to do with the fact that the fl.4 was a different design and may have been a real improvement over the fl.5. They do differ in optical and mechanical design and are distinct from one another. 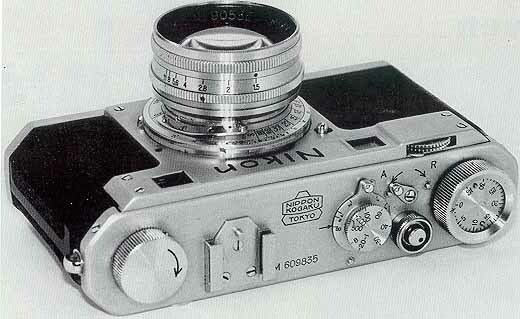 Whatever the reason, the fl.5 Nikkor was short-lived and is now one of the most collectible of the Nikon normals. It was made only during the occupation so all samples are marked "Tokyo" and lack click stops. It also only stops down to fll which is unique to this lens! The barrel is slimmer than the following fl.4 and this lens actually used 40.5mm accessories just like the slower f2.0! 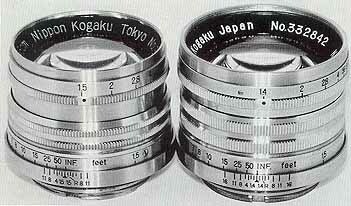 The barrels also differ in that the placement of the diaphragm control ring is reversed from that on the fl.4 lenses. Based on their probable production period, most fl.5 Nikkors should be found on Nikon M bodies ranging from about M6091000 to as late as M6092200, with the bulk seen before M6092000. However, many have shown up on later bodies which could be the result of switching or upgrading over the years. 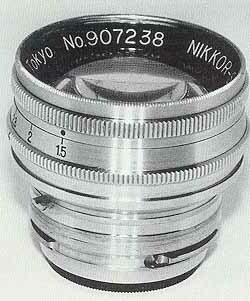 Since it uses 40.5mm accessories, caps and shades for the f2 Nikkor can be used. Some of these lenses have been found with black slip-on caps, but it seems that they are most often to be found with an aluminum slip-on felt lined cap as illustrated here. For comparison I have included photos of a screw mount fl.5 as well as an early fl.4 Nikkor. The screw mount lenses also have 40.5mm threads and many have been found with their interesting aluminum shipping canisters! 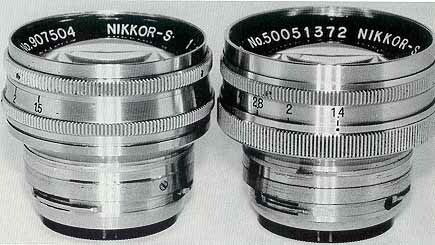 Also note that they are a close-focusing lens (down to 1.5 feet) as was the following screw mount fl.4 Nikkor. Because of its relative rarity, the fl.5 Nikkor-S is today one of the most sought after and expensive normals for the Nikon S system. I would think that it deserves to be! Illustrated on this page are the three known basic variations of the bayonet mount 50mm/fl.5 Nikkor-S lens Although the difference are for the most part only cosmetic it is interesting that a lens made for a little over one year would vary at all! Type One is #90535 in the upper left photo. The barrel configuration of this first type remained basically the same throughout production Note that the diaphragm stops down to only f/11 unique to this lens The "905" series has been reported as high as #905520 with screw mount lenses intermixed. 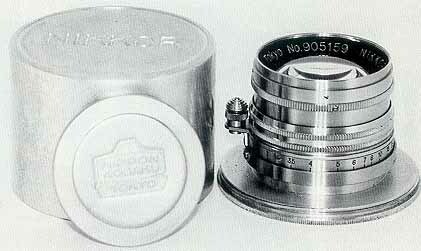 Note that the engraving of the identification ring is large and quite "fine" typical of many early Nikkors Type Two in the above photo now is numbered '1907", 6titt has the large engravings (but deeper now) and appears identical to Type One. The "907" lenses go as high as 907734. Type Three is shown in the photo at the left. Still a "907", we now have a more modern smaller type face used. One other difference is that the leading edge of the filter ring on this lens is not se4tated as it is on the two previous types otherwise it appears to be identical. The bottom photo shows all three types tined up for comparison. The obvious differences in numbering and style are clearly shown, as is the great similarity of the barrels. 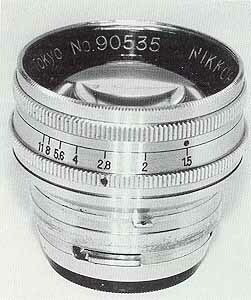 Screw mount lenses were produced throughout the run of the f1.5 Nikkor although collected numbers suggest they are more common during the earlier "905"series For comparison, sc4ew mount lens #905159 is illustrated here Note that this lens has the larger engraving style yet is more like Type Two on the previous page. This particular lens came to me in its original aluminum shipping canister, which is often 6een with the early screw mount Nikkors. These canisters also exist in black bakelite as well as for the bayonet lenses but much less frequently The photo at left is a good comparison shot of both types of mounts. In the bottom photo it is mounted on an early MIOJ Nicca body, which is where the vast maj04ity 06 the screw mount f1.5s were originally mounted! Note that the screw mount version still stops down to only f/11, and that Nippon Kogaku has reversed the direction of the diaphragm ring to correspond with the Leica style. Top photo shows the early "905" lens on a six-digit Nikon M. Actually this body is a little too early for this lens as most have been found on Ms beginning at around M6091000. Photo at right is a comparison of the late f1.5 and the early f1.4 Nikkors! They are different lenses in that the f1.4 has a 43mm thread white the f1.5 has a 40.5 size This makes the f1.5 a little more compact , although length is nearly identical. The major difference is in the two knurled rings. In the f1.5 the front ring is fixed & carries the index dot white the back ring is used to change f-stops, which have no clicks. In the f1.4 the back ring is fixed and carries the index dot, white the front ring is used to change f-stops, which do have clicks In other words, they are reversed! The bottom photo shows sc4ew mount f1.5 and f1.4 lenses The f1.4 again is 43mm making the f1.5 appear a little smaller Note that both lenses are "close-focusing" down to 1.5 feet, and that they function exactly the same! These two are quite similar, although the f1.4 has clicks and stops down to f16.